The zodiac’s ruler of the material world is the sign of the Bull: Taurus. When planets move through the Bull’s territory in the heavens, money and possessions are affected down here on Earth. 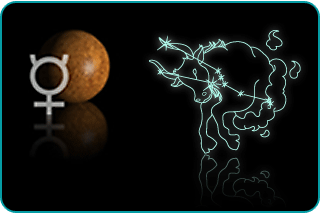 Mercury, the planet of communication, is in the sign of the Bull for an extended period of time beginning April 2. Usually Mercury is in a sign for three weeks before it quickly moves on to another sign. Even the three times each year that it turns retrograde and appears to be moving backward across the sky, it will revisit a sign for a week or two that it had visited a few weeks prior. But Mercury will be staying a full ten consecutive weeks in Taurus, almost the longest it is mathematically able to stay in one sign based on its planetary speed and relationship to Earth. This extended period of time in one sign will bring out the best and the worst traits of the planet during its passage. Expect that getting your message across will be easy during the first part of the forecast period, difficult during the retrograde of Mercury (April 17 through May 11), and then improving again. The good news is that on June 10, Mercury leaves Taurus for the sign it rules: Gemini. While this is great for communication, Taurus is the money sign and you may as well use Mercury’s extended visit to ask for what you want from the material plane. Read your sign below to learn the best way and times to ask for what you want. Nothing fuels the acquisitive impulse like Taurus and no planet can communicate better than Mercury. Birthday money and a chance to invest in a project that excites you are two of the many financial windfalls coming your way while mercury visits zodiac Taurus. Asking: Ask for money on May 11. Waiting: Hold back material pursuits on April 4 and 5. Mercury in your sign will make your voice be heard, but the indecision of what you really want in life may plague you. Let people know that you are still a force with which to be reckoned. Asking: May 26 through May 29 is a window of opportunity to get what you want. Waiting: The entire retrograde period (from April 17 through May 11) is one to go back over things, not make new advances. The chances are increasing that you can score a financial gain. Mercury is, after all, your ruling planet. Utilize your ability to envision and comprehend how all of the little details add up to a wonderful big picture of your success. Asking: May 22 will bring inspiration on how to get rich. Waiting: April 18 will tempt you, only to sink your wallet. You will have many opportunities to interact with people who could be brought on board to help you get what you want. Finances and material opportunities could be at an all-time high if you would only ask. Asking: May 13 and 14 are the best days for a new pursuit of financial gain. Waiting: The week prior, May 6-12, seems to offer easy money but is costly. If you have a co-worker or classmate who is connected in the company or at school, find out if you too could make use of these connections. What is so special about him or her that you could not replicate? Mercury in Taurus rewards those who seize the initiative. Asking: May 26 and 27 are your dream dates as far as financial advice. Waiting: April 11 and 12 – the deal seems easy, but the cost to you will be too high. An educated guess can put you in the driver’s seat, as a wealthy associate sees the wisdom of your ways. Use your connections to make a long-term deal, not just a quick financial score. Asking: Make your move on May 22. Waiting: The day that will fool you into a false sense of security is April 18. Belief in an angel investor will allow you to hang in there until one miraculously appears. Your project can receive the financing you so desire. Asking: The last week of May is the best time to make that investment. Waiting: The chaos of the entire Mercury retrograde period is one to avoid. Partnership tension will actually bring about new ideas of financial independence. Look to get a business partner’s input on where your money is going. Asking: May 10 and 11 work well to get what you want. Waiting: April 18 sees you making foolish requests. Mercury in Taurus means that it is time to ask for a raise. If you have been working under the same pay scale for a year or more, regardless of the economy, it is time to get a better shake. Asking: May 18 is almost foolproof to get what you want. Waiting: May 22 and 23 are tense and not worth the risk. Children feature prominently in your life while Mercury is in Taurus. Get what you want by tapping into the childlike wellspring of creativity that you once had. Asking: You can get anything you want on June 8. Waiting: May 23 sees inadequacies exaggerated to extremes. The crux of the matter is that you are going through a radical change and letting people know about it is of primary importance. Entertaining at home raises money and sympathy. Asking: May 27 is the biggest day of the year and begins the biggest weekend of the year. Waiting: Mother’s Day, May 9, can pull you into two places at once. Mercury’s visit to Taurus should be one of the best times to promote your projects and ideas. If you have an artistic endeavor, you can finally earn money at it. Asking: May 6 is when you must strike. Waiting: June 8 will be too risky to make waves.